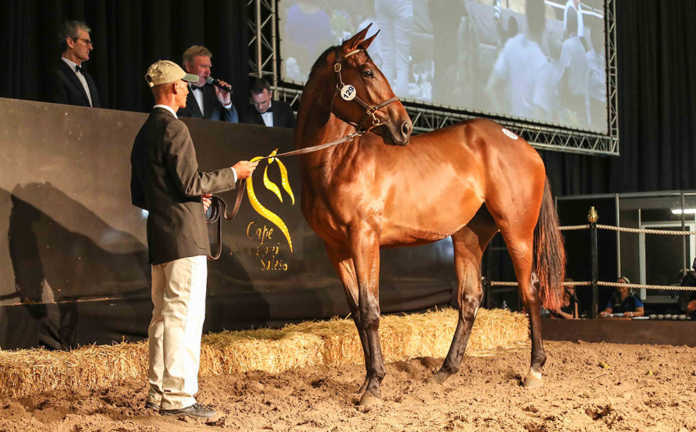 The highest-priced horse at the annual Cape Premier Yearling Sale held yesterday was an unnamed filly that sold for R4 million. Back (from left): John O’Kelly, Andrew Miller and Grant Burns (auctioneers). Front: The filly with Klawervlei groom, Allan Nel. The highest price achieved at the annual Cape Premier Yearling Sale held in Cape Town yesterday was R4 million for an unnamed filly, one of the last progeny of one of South Africa’s top Thoroughbred sires, the late Captain Al. The filly was bred by Klawervlei Stud and bought by international bloodstock agent, Anthony Stroud, of Stroud Coleman Bloodstock, on behalf of a South African buyer. Klawervlei was also the top vendor this year with its 48 young horses on offer selling for more than R30 million. Another offspring of Captain Al, the colt Chestnut Bay netted the second highest price of R2,2 million. He was bred by Ridgemont Highlands and bought by international agent, Amanda Skiffington. 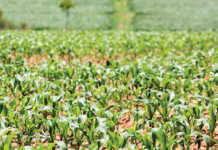 There were 218 lots on offer, of which almost 90% were sold, resulting in total turnover of about R85 million. Captain Al was ranked top sire at the sale, with seven of his progeny selling for more than R11 million. This South African born and bred stallion was previously rated the 25th best Thoroughbred stallion in the world.